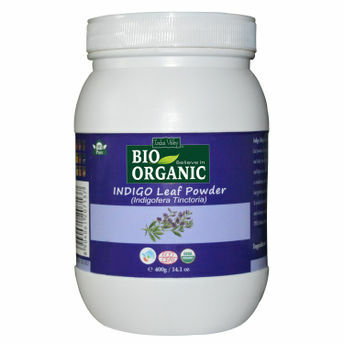 Indus Valley Organic Indigo Powder Hair Color is 100% Organic hair colour with Indigo era Tinctorial. This is 100% Natural hair colour as it is extracted and made from the leaves of the respective plants. It contains no ammonia, no Ppd, no Pesticides and no Synthetic Fertilisers and is a 100% no chemical hair colour. This amazing product is the perfect solution for hair care. It helps in providing for the complete nourishment of the scalp and the hair follicles. This organic indigo powder for hair contains Indigo Leaves (Indigo era Tinctorial) which is instrumental to give dark blue colour. The same, when added with Henna, gives black colour. You can experiment with a number of shades like burgundy, red, brown with the help of the recipe book that comes with it. Additional Information:"Indus Valley" is an ayurvedic cosmetic brand with a wide range of natural Organic Certified & Halal Certified hair dyes, organic hair and skin care products. Their factory is situated in Lower Himalayas in the eco-friendly surrounding to produce high-quality natural cosmetics.The brand is Ecocert, USDA Organic certified.